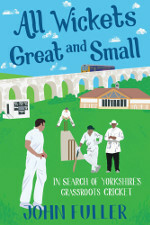 Subtitled “In Search of Yorkshire’s Grassroots Cricket”, journalist John Fuller’s first cricket book is a gentle meander through the hills and dales of the amatuer game in Fuller’s home county of Yorkshire. During the summer of 2015, Fuller embarked upon something of a cricketing pilgrimage, visiting thirty-odd of the 778 registered clubs in the White Rose County, in an attempt to rediscover the soul of the game. The result is this series of tales, typically beginning with a train journey, then a short walk to a ground great or small, at which tea is drunk for the love of tea, cake eaten for the love of cake, and cricket played for the love of cricket. All Wickets Great and Small is not a joyful book – but if a sense of melancholy pervades, it might only be because, in so many ways, the game of which Fuller goes in search, sadly really has seen better days. It is nevertheless, a book written with love and honesty, which is worthy of its place on any cricketing bookshelf. As regular readers will know, it’s Spin City in women’s international cricket, these days more so than ever, and the top 6 players in our Women’s International Championship bowling rankings are all spinners. Australia’s Jess Jonassen was the leading wicket-taker in the Championship, with 31 wickets, though she was a little bit more expensive than some: her best figures – a 5-fer against New Zealand – came at the expense of 50 runs off 9 overs that day. At No.2 Anisa Mohammed – the first bowler ever (male or female) to take 100 wickets in T20 internationals – has been crucial to the West Indies’ cause in ODIs too, as they scrapped their way to the final direct World Cup qualification spot. At No. 3, Rajeshwari Gayakwad is perhaps the surprise entry in the top 10 – an orthodox left-armer, she first really announced herself against England at Scarbados back in 2014, when she took 4-42, including the scalps of Sarah Taylor and Nat Sciver. 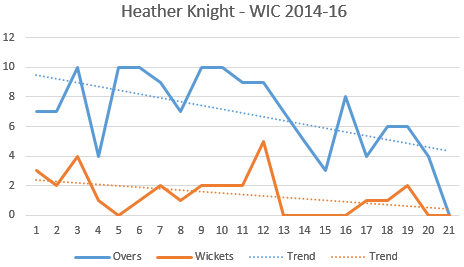 She has been remarkably consistent throughout the Championship, taking 2 wickets here and 3 there, finishing with 2 more 4-fers in the series versus the West Indies. It shows that she has been bowling less and less – especially since she took over the captaincy. My experience watching Knight captain at Berkshire for many years suggests that she tends to bowl herself when she feels they are in trouble, which they rarely have been with the ball at least over the past year or so. Australia’s 3-0 series victory versus South Africa this week brings to a close the largest international cricket tournament ever staged – 84 matches* played over 2½ years – offering the perfect opportunity to pull-together some pretty definitive rankings for batsmen, bowlers and all-rounders. There will be little surprise as to who tops the batting rankings – Wisden’s 2014 women’s award winner, Meg Lanning, who scored 5 centuries and another 5 fifties in the championship, amassing well over 1000 runs in total. The good news for the opposition though is that if you get Lanning out… in walks Ellyse Perry, ranked at No. 3 on our list! Martin Davies from WCB commented to us the other day that Perry is becoming more and more a batsman who bowls a bit, and there is little doubt that she would merit selection in anyone’s World XI, even if she didn’t bowl at all. Only one batsman finished the tournament with a Strike Rate over 100 – Nat Sciver – the highest-ranked England player at No. 7. Though a few tail-enders also achieved a Strike Rate of 100+ on a handful of innings, Sciver did it across 16 innings, scoring 533 runs in total, including 6 fifties. * In theory at least – though of course a few of those matches weren’t actually played! The next largest was the 1997 ICC Trophy – 82 matches, excluding warm-ups – thanks to Peter Griffiths of cricketarchive.com for the info on this! The ICC’s Technical Committee has ruled that India are responsible for not playing their Women’s International Championship series with Pakistan – awarding Pakistan all 6 points, and mandating that India’s Net Run Rate be adjusted to award 0 runs from 50 overs in each of the 3 “missing” matches. The series was supposed to have been played earlier this year, with Pakistan hosting; but the BCCI are currently unwilling to participate in bilateral series with Pakistan, in either the men’s or women’s games, due to the ongoing geopolitical situation between the two countries, and India are understood to have simply never replied to Pakistan’s invitation to play the matches in the UAE. Assuming that the decision is upheld, it confirms the final standings in the Women’s International Championship, with Australia, England, New Zealand and the West Indies going directly to the World Cup in England next year; whilst South Africa, India, Pakistan and Sri Lanka will join Ireland and Scotland, plus Zimbabwe, Bangladesh, Papua New Guinea and Thailand, in a qualifying tournament in Sri Lanka next February to decide the other 4 teams who will compete in England. Having sealed their World Cup qualification with a win in the first game, England went on to complete a 4-0 ODI series win against Sri Lanka. Things looked dicey for England in the final ODI, as they collapsed to 58-6, before a century-stand between Nat Sciver and Dani Hazell dug them out of the hole. England then bowled their hosts out for 78, with Laura Marsh taking 4-21. The White Ferns completed a whitewash of their own against Pakistan, with a 5-0 series victory, which guaranteed their qualification for the World Cup. But on the other hand she did finish it with a series batting average of 197! Satterthwaite scored 3 centuries, all at well over a run-a-ball, to finish the calendar year with a massive 977 international runs, having also chipped-in with 21 wickets. There was yet another whitewash in the India v West Indies series – 3-0 to India; but it looks like it will still be West Indies heading directly to the World Cup. Even if the ICC decide later this week that the points should be shared from India’s unplayed series versus Pakistan, leaving both India and West Indies on 21 points, West Indies will go through on games won, and India must play the qualifying tournament, along with South Africa, who forfeited their outside chance of direct qualification, losing the 1st ODI to Australia. The final weekend of round-robin matches saw Queensland Fire and New South Wales Breakers qualify for December’s final. With the Southern Stars occupied against South Africa, it was up to the domestic squads to step up. For the Fire, Beth Mooney hit a century (146 off 144 balls) as they beat Vic Spirit to finish top of the table; whilst for the Breakers Sarah Aley took 3-33, as they bowled-out the ACT Meteors to win their shoot-out by 13 runs and grab the other final spot.